Heartless by Marissa Meyer. Feiwel & Friends, 2016. Hardcover. 449. I'm a sucker for retellings and I also love Alice in Wonderland, so a retelling set in the wonderful world Lewis Carroll created sounded perfect, especially considering it's about the Queen of Hearts before becoming the Queen — this definitely sounded like it would hit the sweet spot of books for me. And it did. 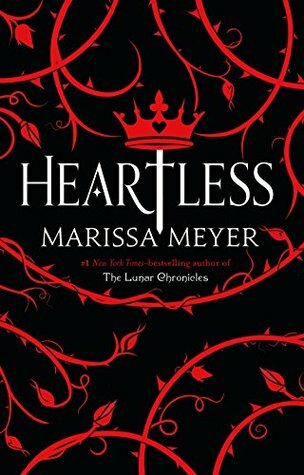 Before I begin my review, I'd just like make a quick note that I have not yet read Meyer's Lunar Chronicles, so I really had no idea what to expect from Meyer going into Heartless. I haven't been particularly interested in the Lunar Chronicles, but I may eventually get around to them. Or I might not. I'm not sure. Anyway, let's review Heartless! I don't even know how to put into words how incredible this book was. This was everything I wanted. I know there have been some mixed reviews on this, and I completely understand each and every one of them and both their negative and positive points, but I personally enjoyed reading this book so much that I could not help but fall in love with it. The biggest aspect of this book that I loved was the world itself, which also includes Meyer's exquisite writing and description. This world had whimsy and wonder and such a sharp attention to detail that I was incredibly captivated by everything. I never wanted to leave. Everything in this book had a personality, from the doorknobs to the candles, and I love that kind of thing. Some of my favorite parts of books are when authors mention tiny details of background happenings that are quirky or just add more fleshed out layers of worldbuilding. It made everything feel so authentically Alice in Wonderland, and I felt so sucked into the world. Another great part of Heartless was the witty dialogue. Page after page of wit, banter, rhymes — it made this book such an enjoyable experience and a breeze to read. I didn't want it to stop. It also had darkness. Oh boy, it had darkness. Heartless went so subtlety from a whimsy, sweet romance, to hidden madness and unease, then complete anger and darkness and I loved it. Now, here's what's tricky to explain. In the beginning and first half of the book, I wasn't overly impressed with the plot and the romance that was happening. It was entertaining and I enjoyed it, but the purpose of the book so far didn't seem overly strong was this just a book about her not wanting to marry the king and trying to find a way to open her bakery and run off with her true love? (Answer: Yes and no) But the fact is that the world building and the writing and the details were all done so well that I didn't even care and I just enjoyed it for what it was without dissecting anything. Plus, it felt like there were enough subtle hints about things that I had a feeling more might happen. And boy did it. There is definitely a lot more to this book than meets the eye. Cath is an interesting character. I'm not sure that I can ever say I truly loved her character, and I think that is where a lot of the reviews turn negative. She's an endearing character in some ways - her sweet disposition, her passion for baking, her wittiness — but she's also a bit frustrating and not always the nicest person, such as her making fun of people, her refusal to be honest with the king, etc. But the thing about this is that I'm not sure if we're really meant to fall in love with her. I certainly empathized with her and, on the whole, loved reading about her and her personality, but I can see where she might have rubbed some people the wrong way. Her development and dynamic features, however, were incredibly well-done, and I can't say that enough. I felt her passion and dream to open a bakery and her desire not to ignore her dreams and just do what was required by her parents. Cath didn't have the strongest backbone of the characters for the entire story necessarily, but I admired how she grew and developed more confidence and strength in herself as the story progressed. And I sort of love the final result. The entire change that Cath goes through was just remarkable in my opinion, and while I'm not one that necessarily thirsts for revenge in circumstances, I completely understand how pain and rage can turn people into someone they don't know anymore. Jest was lovely. I loved his wit, charm, and his overall suave. He seemed so innocent and adorable in the beginning, but we soon learn that he has a quite more than to him than is apparent to the eye. He carries with him an air of mystery that matches his level of charm and humor. And then we have the king, a man that I liked and disliked at the same time. He was adorable in some ways, but I can also completely understand how infuriating he is - and, frankly, how infuriating all of Hearts. They are not a society that likes to confront and deal with conflict, but instead prefer to brush it under the rug and pretend it never happened. I can completely understand this outlook, but it's not exactly a wise way in which to live one's life. The rest of the characters, such as Hatta, Haigha, the turtle, Mary Ann, and many others were all a delight to read about. I'm not going to go into much more detail on much more than I have, however, because I think this book is fun to go into and explore all on your own. And a quick warning: Heartless will make you want to eat any and all baked goods in sight, or you will want to go buy or make delicious treats and pastries, so be warned! Overall, Heartless gets five stars from me! So glad to hear you liked this one so much! I think a lot of the negative reviews are from people who were expecting something like the Lunar Chronicles...of which I am one, but I haven't read it yet. Due to the reviews I'm trying to get rid of my expectations and just enjoy it as a different type of story altogether!